Outfitted with a temperature sensor, a Bluetooth radio, and WeMo integration, this sturdy no-stick skillet can help you create perfectly cooked dishes. Digital technology is invading the kitchen. Hard on the heels of the Bluetooth-enabled kitchen scales Drop and Perfect Bake, which promise perfect ingredient measurement while providing detailed cooking instructions, comes the Pantelligent Smart Pan ($199, available at Amazon), a Bluetooth-enabled skillet that monitors cooking temperature while providing—wait for it—detailed cooking instructions. It works amazingly well, but requires a lot of attention that experienced chefs might not be willing to invest. Like so many new connected-home gadgets, the Pantelligent uses low-power Bluetooth to link with a mobile app running on an Android or iOS device. 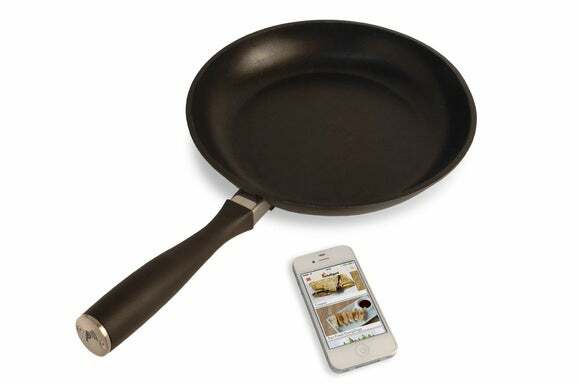 In the Pantelligent’s case, the smartphone app uses data from the skillet’s built-in heat sensors (which measure the temperature on its cooking surface) to advise you as whether to raise or lower the heat and when to flip, stir, or add ingredients for the couple of hundred included recipes. 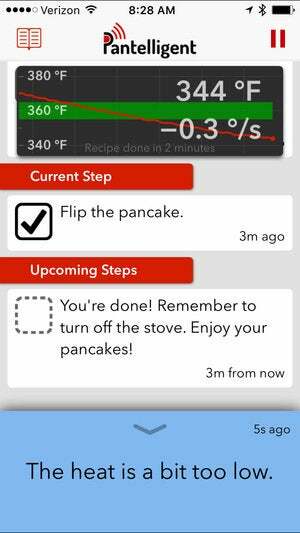 In some cases, the app adjusts cooking times based on what it knows about how much heat you’ve applied. And recently, the app has gained the ability to automate hot-plate temperature adjustment for hot-plates connected to electrical outlets through a WeMo Insight switch (which can turn power on or off via instructions delivered over Wi-Fi). I'll have more on that later. The pantelligent looks much like any other high-end skillet, until you take a gander at the end of its handle. As someone who’s been cooking without digital assistance for some four decades, I didn’t expect to get much out of Pantelligent. 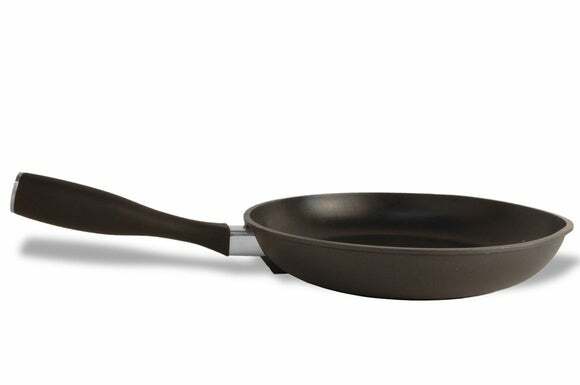 And at its current price of $199, it’s definitely expensive, even for a sturdy-looking, 12-inch, non-stick skillet. But after trying out several recipes—both from within the app and from my own repertoire—I was nonetheless impressed at how well everything turned out. And I liked one of the recipes so much I’ve since adapted it for my own non-Pantelligent use. I’m still on the fence as to the value for experienced chefs, but I can see it would be a boon for newbies (think wedding gift) or anyone willing to babysit their cooktop cuisine in the name of perfection. The Pantelligent app not only guides you through the cooking process stype by step, but it can tell you when to raise or lower the heat so that you meal comes out perfect. The Pantelligent is super-easy to set up: Install the free app, make sure Bluetooth is turned on, and approach the pan: It will immediately pair with your mobile device. Now you’re ready to cook. Pick a recipe—choices range from super easy (e.g. scrambled eggs, steak) to gourmet fare (mushroom risotto, chicken piccata)—follow its instructions for food prep, and tap on the Start Cooking! button. 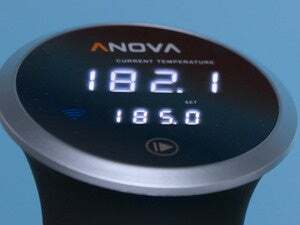 This immediately brings up step-by-step instructions, typically starting by telling you to heat the pan to a certain temperature, along with a screen showing progress towards that temperature. 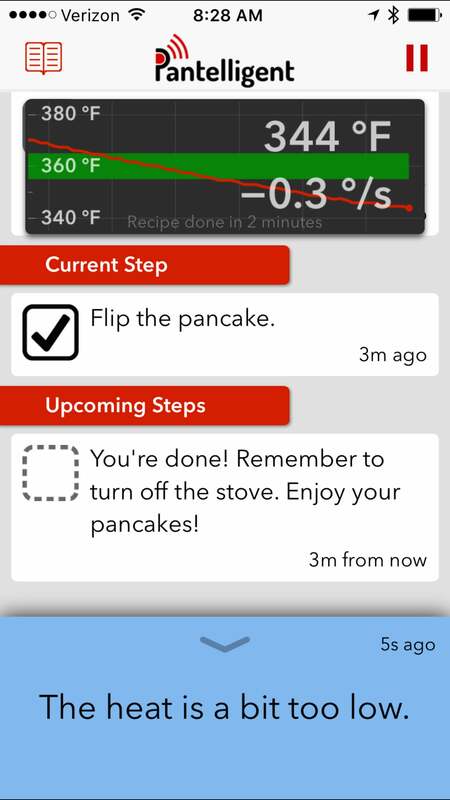 When you are within 10 degrees Fahrenheit of the target temperature, the app will tell you what to add to start cooking. After that, if the temperature strays more than 10 degrees in either direction from the target, the app will tell you to raise or lower the heat accordingly. And when I say "tell," I mean that by default you get voice as well as screen prompts (sort of like when you use a GPS). You can turn off the voice prompts, but then you’d better keep your eye on the app screen so as not to miss instructions about adjusting the heat. What I realized when I began using the Pantelligent is that the temperature varies a lot when I’m cooking something, so the app was telling me to raise or lower the heat on my burner every 20 seconds or so. That’s a lot more adjusting than I’m accustomed to making. Also, there invariably was a certain amount of lag between when I adjusted the heat and when the app detected the adjustment, which probably contributed to the number of adjustment prompts. For some recipes, the app actually adjusts cooking times based on how much heat has been applied. Pantelligent co-founder Humberto Evans (an engineer who learned cooking in his family’s restaurant) says the ability to adjust recipes on the fly depends on the way different foods absorb heat. Despite my worries about constant nagging to raise or lower the heat, the dishes I tried all came out perfectly, including a rib-eye steak cooked medium rare, the mushroom risotto, and the chicken piccata. (The Pantelligent app invites you to snap images of your creations and post them to its website.) I also tried using the app in so-called freestyle mode, recording my own recipes. But I found this less useful, perhaps because I was already adjusting the heat on my own and the prompts from the app seemed superfluous. Still, I liked seeing how hot the skillet was on my smartphone screen. The hot-plate support through a WeMo switch—a feature called Autopilot—is the newest addition to the Pantelligent’s abilities. Instead of telling you to adjust the heat of your stove to attain a target temperature, Autopilot controls the hot plate heat by turning the appliance off or on through the WeMo switch. Again, setup proved pretty easy: Once you install the WeMo switch by connecting it to your Wi-Fi network, you run the Pantelligent app (with your mobile devices connected to your Wi-Fi network) and activate Autopilot, which detects and links to the switch. Then, when you start a recipe, you don’t have to intervene except to add, flip or remove ingredients. Seasoned chefs might become irritated by the app's micromanaging ways. I tried Autopilot out by making buttermilk pancakes (from scratch!) on a Waring hot-plate that Pantelligent officially supports. The hot-plate was plugged into a WeMo switch which in turn plugged into a wall outlet. Again, Autopilot worked as advertised: When Pantelligent sensed the heat was too high, it had the WeMo switch turn off the hot-plate (it doesn’t actually adjust the temperature), and vice versa. All I had to do was add the batter and then flip the pancakes when the app told me to. I do have a couple of quibbles about the Pantelligent. First of all, the recipes are mostly good for a single serving, or occasionally two servings. That makes Pantelligent of limited use if you want to have a dinner party. I did try doubling some recipes, and had to adjust cooking times on my own. The Pantelligent doesn’t work with induction cooktops, making it a non-starter for many. And the recipes sometimes lacked precision: For example, the risotto recipe called for a chopped shallot, with no indication of how large the shallot should be (in my experience they come in lots of sizes). It also didn’t offer any details on how thick to slice the mushrooms. For an app that’s supposed to caters to newbies, I would expect more details. I do admire the Pantelligent’s construction (although at its price, I think it should have come with its own lid). Its Bluetooth radio and battery are stored in a handle that’s only a little thicker than some I’ve seen, and Pantelligent’s Evans says the battery should run for a year before you need to replace it. But because of how the Pantelligent is built, you shouldn’t put it in a dishwasher (it is otherwise submersible). The Pantelligent isn’t for everyone. If you're happy with your cooking skills, you may prefer to invest in other kitchen gadgets. But novice chefs and perfectionists might well find the expense worth it to achieve more insight into and control over the cooking process. 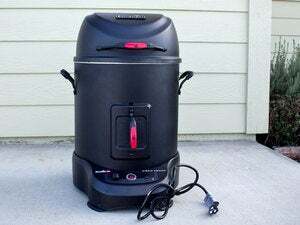 Correction: This story was updated to reflect the current shipping price of $199 and to report that the pan is submersible, but not dishwasher safe. 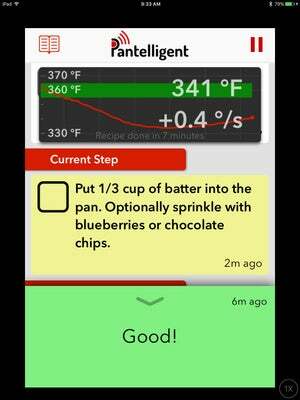 The Pantelligent Smart Pan and its companion app can help you cook food to perfection, if you’re willing to make the frequent adjustments it demands.